Welcome to my SmileBASIC Tutorial. Now that you've gone to edit let's add some BASIC commands PRINT "Text String" - use to print a text string. change the text string if you want. PRINT NumValue - Print a number value PRINT StringValue$ - Print a stored string ACLS - You should always put this at the start of your program it clears the following things: Sprites BG images Things cleared with GCLS SPDEFinition numbers Fonts However, it does NOT clear variables and BGM-Related things LOCATE X,Y,Z (Z is optional) - use to locate text COLOR Color - The included colors are #TBLACK #TBLUE #TCYAN #TGRAY #TGREEN #TLIME #TMAGENTA #TMAROON #TNAVY #TOLIVE #TPURPLE #TRED #TTEAL #TWHITE #TYELLOW RGB(R,G,B) R, G and B and be numbers or a number value (see equals) ==, =, !=, >, >=, < & <= - = is a version of LET from conventional BASIC, the rest are for IF, which will be explained later on == is for testing if a number value or string is a certain value or string. >= is for the same as equals except it's equal to or greater than, > is just greater than and nothing else. <= is equal to or less than. < is less than. != is NOT equal to GCLS - clear the graphic screen CLS - clear the console screen END - Stops the game prematurely (before reaching the last line) or ENDs a DEF (DEFs will be in the advanced tutorial (the third one) ) FADE Color - Use THESE colors for this: #BLACK #BLUE #CYAN #GRAY #GREEN #LIME #MAGENTA #MAROON #NAVY #OLIVE #PURPLE #RED #TEAL #WHITE #YELLOW GOTO and GOSUB @labelname - use in combination with @label. GOTO - goes to the label. RETURN doesn't work. GOSUB - Same as GOTO, but RETURN works @label - the label can be anything that doesn't include spaces. explained in GOTO and GOSUB. RETURN - Returns to the line after GOSUB was used after using GOSUB. Not using GOSUB and this being used leads to a nasty error. This will never be finished. What new tutorial? Welcome to my SmileBASIC Tutorial. Now that you've gone to edit let's add some BASIC commands PRINT "Text String" - use to print a text string. change the text string if you want. PRINT NumValue - Print a number value PRINT StringValue$ - Print a stored string ACLS - You should always put this at the start of your program it clears the following things: Sprites BG images Things cleared with GCLS SPDEFinition numbers Fonts However, it does NOT clear variables and BGM-Related things LOCATE X,Y,Z (Z is optional) - use to locate text COLOR Color - The included colors are #TBLACK #TBLUE #TCYAN #TGRAY #TGREEN #TLIME #TMAGENTA #TMAROON #TNAVY #TOLIVE #TPURPLE #TRED #TTEAL #TWHITE #TYELLOW RGB(R,G,B) R, G and B and be numbers or a number value (see equals) ==, =, !=, >, >=, < & <= - = is a version of LET from conventional BASIC, the rest are for IF, which will be explained later on == is for testing if a number value or string is a certain value or string. >= is for the same as equals except it's equal to or greater than, > is just greater than and nothing else. <= is equal to or less than. < is less than. != is NOT equal to GCLS - clear the graphic screen CLS - clear the console screen END - Stops the game prematurely (before reaching the last line) or ENDs a DEF (DEFs will be in the advanced tutorial (the third one) ) FADE Color - Use THESE colors for this: #BLACK #BLUE #CYAN #GRAY #GREEN #LIME #MAGENTA #MAROON #NAVY #OLIVE #PURPLE #RED #TEAL #WHITE #YELLOW GOTO and GOSUB @labelname - use in combination with @label. GOTO - goes to the label. RETURN doesn't work. GOSUB - Same as GOTO, but RETURN works @label - the label can be anything that doesn't include spaces. explained in GOTO and GOSUB. RETURN - Returns to the line after GOSUB was used after using GOSUB. Not using GOSUB and this being used leads to a nasty error. This will never be finished. You investigate the heck out of that nothing. You wonder how you mistook it for a New Tutorial. 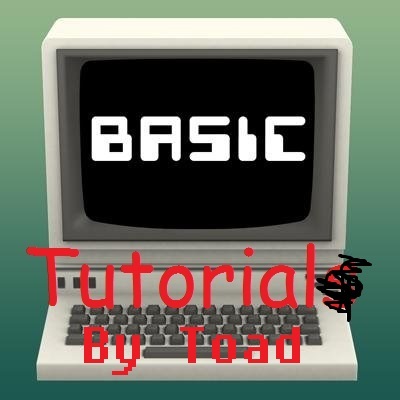 You feel a real new tutorial will be released in 2020.
you described the command by using its name. That’s not explaining, that’s repetition. ACLS shouldn’t be “always” used at the beginning of the program. END doesn’t necessarily end the program prematurely. Using END at the end of a DEF statement doesn’t end the program. STOP will end the program. I felt that you implied the RGB function could be used with COLOR because you mentioned it right after COLOR. you go from explaining how to print, to operators.